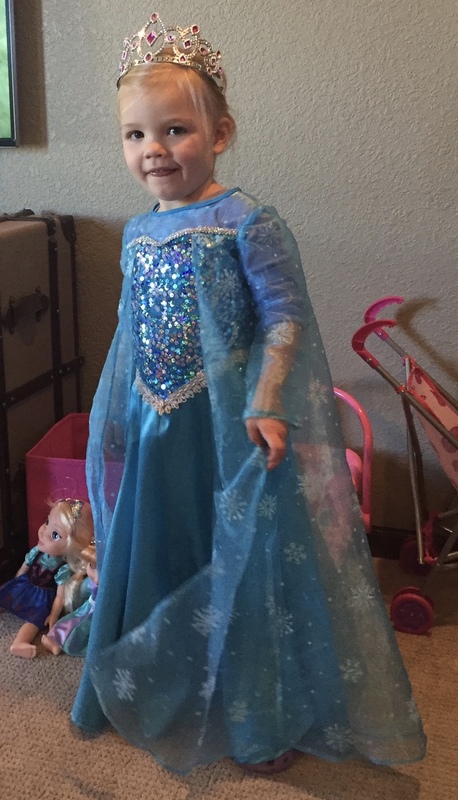 For my niece’s birthday in early October, I decided to indulge in her love of all-things-Frozen and make her a Princess Elsa dress. Of course, it was more than convenient that Halloween followed shortly thereafter. Scroll to the bottom of the post (or just keep reading) to see the finished dress on my muse! 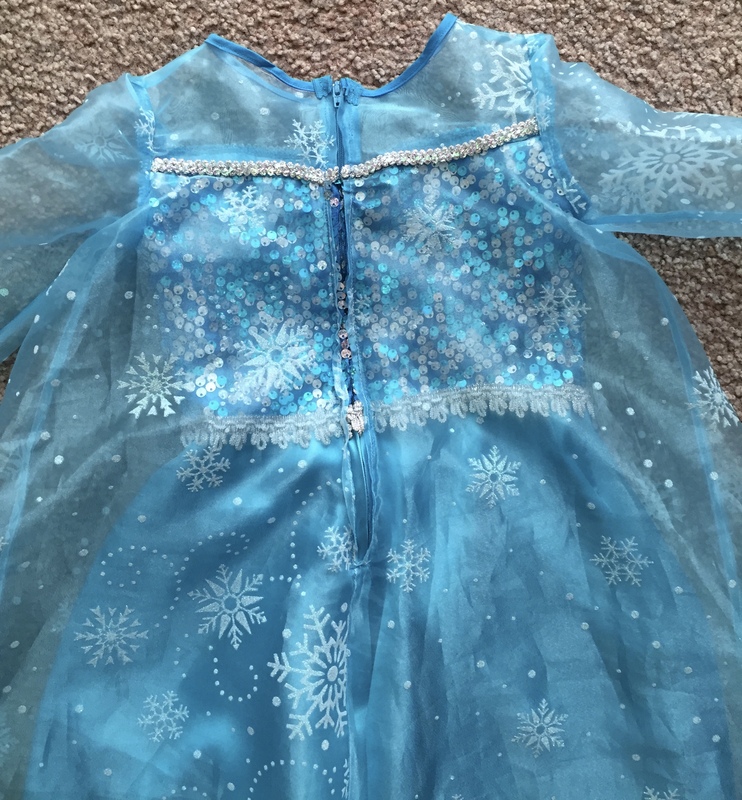 I looked at a few pinterest ideas on easy DIY Elsa costumes before settling on a Simplicity Pattern since I thought this would help me with the sizing of pattern pieces. 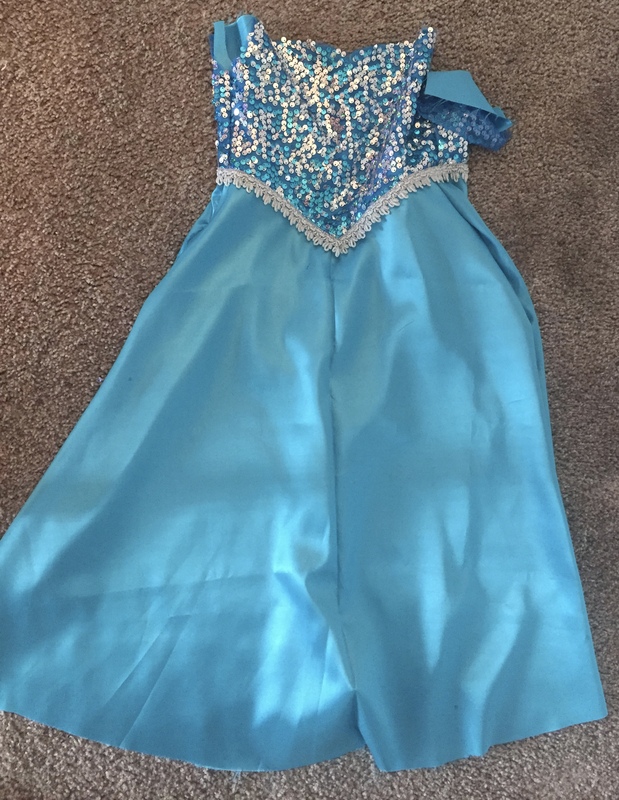 This also gave me my first opportunity to sew with costume fabrics: polyester sequin, satin, organza, and silver metallic trim (3/4″ and 3/8″) (click the links to see the exact fabric I purchased from Joann Fabrics). The pattern also called for silver tissue lame and fabric paint to create the appliquéd snowflakes on the cape, but I decided to skip that because I found organza with snowflakes already on it. The cutting and sewing wasn’t nearly as bad as I expected… well, except for the zipper. Also, more than a month after the fact, we are still finding bits of the sequins in our carpet. The first several steps after cutting out the various pieces, involved seaming reinforcing the top edge of the satin skirt and both top and bottom of the sequined bodice with stay-stitching. I was skeptical about the benefit of this, but it really helped the fabric keep its shape when sewing the costume fabrics together. *Note, I also added a layer of the satin to the back of the polyester sequined fabric because it was a bit scratchy and also see-through. * Next, using my serger to create finished inside seams, I sewed the skirt pieces together, the bodice pieces together, and finally the skirt to the bodice. To finish the seam, I stitched the wide (3/4″) silver trim to the waistline of the dress. Next came the cape, which involved finishing the edges with a narrow hem. First pressing under 1/4″, stitching close to pressed edge, trimming close to the stitching, pressing under another 1/8″, and then stitching in place. The seams of the cape were all done using the french seam technique. After sewing the upper edge of the cape to the upper edge of the bodice, it was time for the yoke. The organza yoke needed stay stitching as well, then seaming to the top of the bodice and cape, and finally finishing with the 3/8″ silver metallic trim. Single fold bias tape was used to finish the neck of the organza yoke then came the hardest part…. the dreaded zipper. I added some pictures of the dress with the zipper sewn in. Hopefully, if anyone else tries this pattern or to do your own princess dress, you will have better luck than me. I have done plenty of zippers before this, but the combination of fabrics, multiple intersecting seams, and thick metallic trim all added and bulkiness. Additionally, I had to be careful not to “catch” the free edges of the cape in the zipper seam. I wasn’t very happy with the finished product partially because it just didn’t look very polished, but mostly because the zipper stuck a little in one spot where I sewed too close to the zipper teeth. Obviously functionality was much more important for the 3-year-old recipient of the dress than a perfect looking zipper and seam. 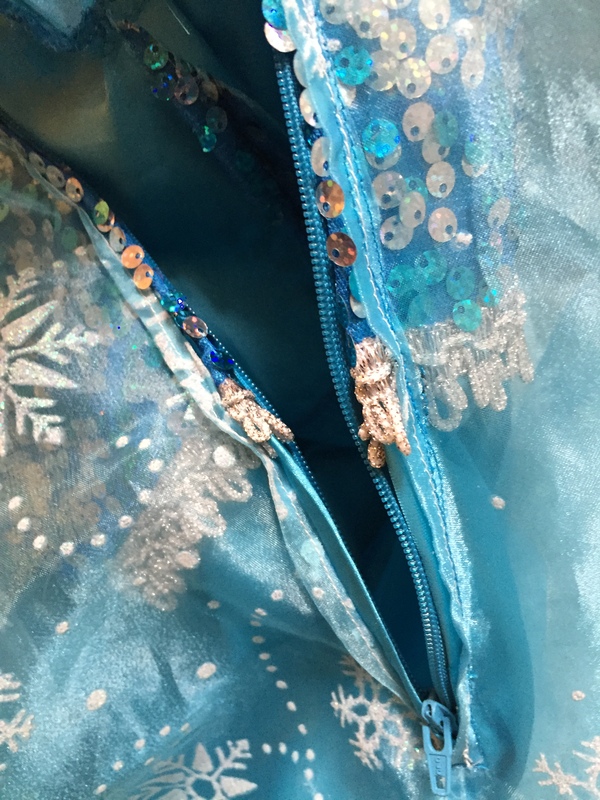 I have been trying to figure out how I would have improved the pattern to avoid these issues – and I guess I would have just stitched as far from the teeth of the zipper as possible, especially where the silver trim intersected with the zipper. Additionally, I would have put in the zipper before finishing the neckline with the bias tape. As you can see in the picture, the pattern instructed the zipper tape to be turned over the seam allowances, but I think it would have looked better to have this under the bias tape. Any tips from readers who have experience with zippers in costume fabrics? Ok – the organza sleeves were done similar to the cape and the yoke. First a french seam to stitch the underarm together, then a narrow hem around the wrist edge. Two basted stitch lines around the armhole edge were used to slightly gather the fabric and ensure the “fullness” was evenly distributed around the seam. 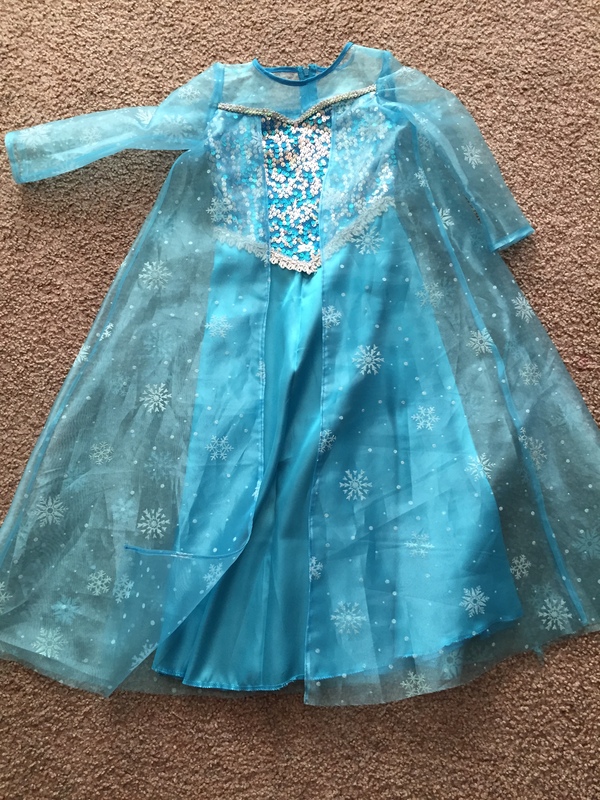 I don’t know if this is enough instruction to do the dress on your own without buying the pattern, but I am happy to post tips, provide more info, or answer questions if you want to give it a try. 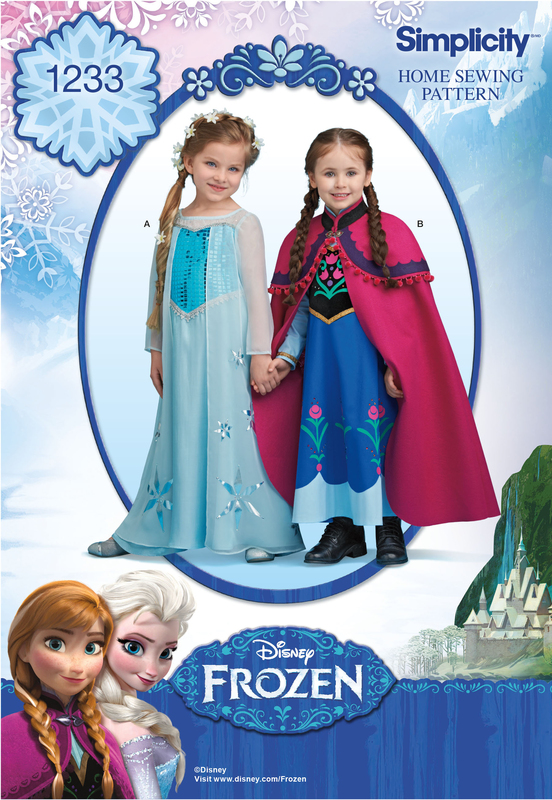 I am sure there are a lot of little girls who would like a princess dress for Christmas! What a beautiful dress on a beautiful young Girl! I hope it will go into her ‘hope chest’ for a future daughter!! I have seen the dress and it is beautiful! You did a wonderful job! One thing I noticed that others may want to do with sequined fabrics. 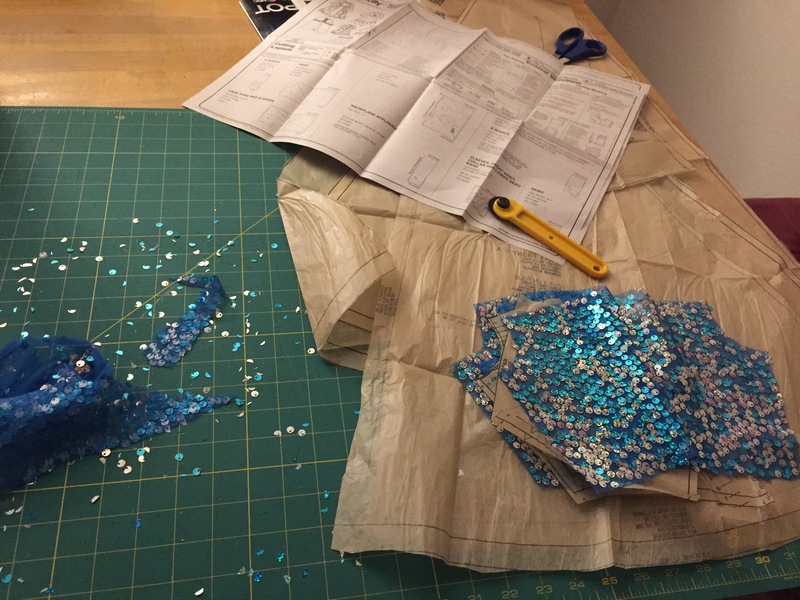 The sequins are best removed from the seam allowance. One reason is that you do not want to hit them with the needle when sewing the seam. Second, it is scratchy without an undergarment. Thanks for the kind words! @sewinggram those are good reminders – I should have taken the care to remove the sequins in the seam allowance! My needle did ok (luckily) but yes, less scratchiness would have been better. Free sewing patterns, sewing clothes and accessories. Dress patterns, skirt patterns, sewing tutorials and a great sewing blog. Endless desire to create has driven me down several roads. Here is the outcropping of that desire, and occasional necessity.